Why is LGA's Instrument Approach Procedure VOR-H misaligned with the runway? 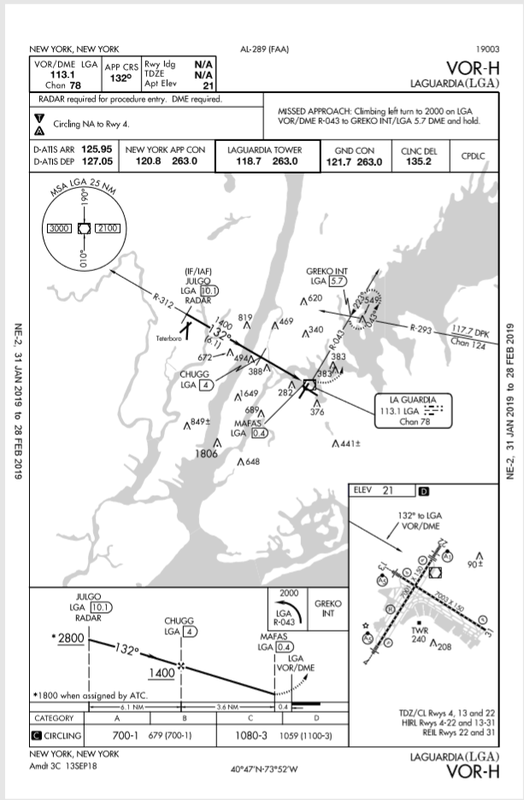 I was looking at LGA's Instrument Approach Procedures, and I noticed that on this IAP plate the final segment (CHUGG to MAFAS) is misaligned with the runway. How should I interpret this? Shouldn't be aligned with the runway, in order for the aircraft to be able to land? Not all approached are aligned with a specific runway; some like this VOR approach into KLGA is not and just uses circling minimums. It is anticipated that the aircrew will, after reaching the MAP at MDA, visually confirm that they have the intended runway of landing in sight, thence circle to land on it visually at or above the circling minimums published. The landing runway would be given by ATC or requested by the flight crew thence approved by ATC. The final approach course alignment with the runway centerline exceeds 30°. The descent gradient is greater than 400 ft/NM from the FAF to the threshold crossing height (TCH). When this maximum gradient is exceeded, the circling only approach procedure may be designed to meet the gradient criteria limits. This does not preclude a straight-in landing if a normal descent and landing can be made in accordance with the applicable CFRs. A runway is not clearly defined on the airfield. See the FAA’s Instrument Procedures Handbook. Because the VOR facility is not on the runway but it is on the field. VOR approaches use VOR facilities and in this case DME measurements to identify fixes and get you down. However not all VOR's are stationed in line with runways. As such the radials may not always precisely align with the runway. In this case its parallel to the runway, in other cases like at my home airport KDYL it may bring you in at a slight angle. This is also a Circling approach so it not necessarily intended to get you onto runway 13 (note no runway is listed on the plate) its merely intended to get you below the cloud layer and circle into another runway (however if you look at the notes circling to Runway 4 is not available). Not the answer you're looking for? Browse other questions tagged landing iaps or ask your own question. When flying a circling approach, is it permitted to begin the visual circling segment prior to the final approach fix? Why do the RNAV (GPS) approaches to KAPC not use the same missed approach procedure as the ILS/LOC approach? Can I circle to a different runway if cleared for an instrument approach without circling minimums? What runway alignment should I expect from a straight-in approach? How can one fly a stabilized approach when the final approach path is curved? Why would an approach be Cat A NA? When and how do I align with the runway during an offset ILS approach? Can some IAFs be skipped if more than one IAF exists?